David Stanley is a former trail-crew worker in Glacier National Park, where he spent six summers during the 1960s. In those years, he worked at St. Mary, Red Eagle, Gunsight, Many Glacier, West Glacier, and the North Fork. He’s been returning to the park ever since. Before he retired from teaching, he was an English professor at Westminster College in Salt Lake City, where he specialized in American literature and folklore and also chaired the college’s Environmental Studies Program. There he taught many classes on environmental literature and writing, focusing on works pertaining to the natural world, wilderness, the preservation movement, and the national parks. 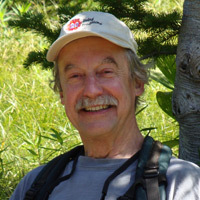 He also initiated the National Park Readers series being published by the University of Utah Press, which includes the newly released Glacier Park Reader, which he edited. David is now retired from teaching and spends his time hiking, camping, and traveling with his wife Nan, as well as continuing with research, writing, and editing. He and Nan live in Salt Lake City.